Breakthroughs in science naturally follow years, often centuries, of skepticism because untested ideas go against conventional thought. Yet discoveries continue to amaze us and unleash the knowledge that will become commonplace for future generations. 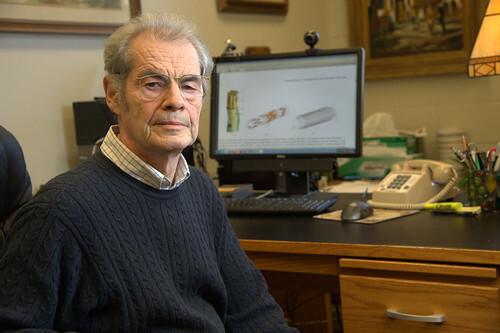 Auburn University Professor Vitaly Vodyanoy has used his personally invented, patented microscopy system to confirm the existence of a primo-vascular system that could provide a scientific foundation for acupuncture and other treatments such as osteopathic manipulation. He revealed for the first time the microstructure of the miniscule, translucent system of vessels, subvessels and stem cell-filled nodes—together making up the primo-vascular system—running throughout a rat's body, appearing in and on blood vessels, organ tissue and the lymphatic system. 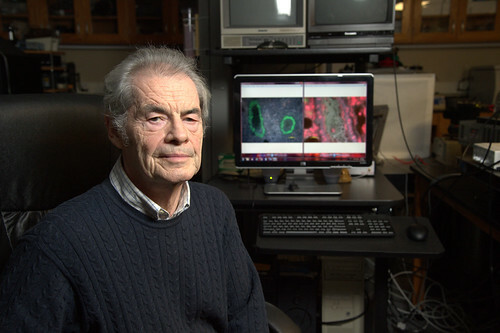 He published his initial research as a chapter, "Characterization of Primo Nodes and Vessels by High Resolution Light Microscopy," in the book, "The Primo Vascular System: Its Role in Cancer and Regeneration," in 2012. He also published three papers in 2015-16. "Even with our microscope, you cannot see the vessels until they are touched because they are transparent, but they turn a yellowish color when touched. The width of the node is only 1 mm, and the fine structure of the node can only be seen using high-resolution light microscopy," said Vodyanoy, Ph.D., professor of anatomy and physiology in the College of Veterinary Medicine. "The rat is an excellent model for research before studies are conducted with humans." Vodyanoy is collaborating with the Lake Erie College of Osteopathic Medicine, or LECOM, in Pennsylvania to test his hypothesis that the nodes, when activated by acupuncture, osteopathic manipulation, pressure or laser, release stem cells that flow to organs where they replace injured cells and become organ cells. In late 2015, LECOM Provost, Senior Vice President and Dean of Academic Affairs Silvia Ferretti, D.O., and Professor Randy Kulesza, Ph.D., visited Vodyanoy in Auburn to discuss the primo-vascular system, which led to a two-year grant from LECOM to fund Vodyanoy's study. Kulesza is a professor of anatomy at LECOM and has been teaching gross anatomy, embryology, histology and neuroscience for 15 years at the school. His research lab has characterized the human auditory brainstem and has identified brainstem hypoplasia in children and adults with autism spectrum disorder. He aims to characterize the primo-vascular system in humans and examine the potential relationships between this system and osteopathic manipulative therapy. The ability of the primo-vascular system to regenerate cells and tissues is consistent with the principle formulated by Andrew Taylor Still, a 19th century American physician and Civil War surgeon who founded osteopathic medicine on the basis that "the body possesses self-regulatory mechanisms, having the inherent capacity to defend, repair and remodel itself." "We are pushing the boundaries of accepted or recognized anatomy and physiology," Vodyanoy said. "Not many people are working on the primo-vascular system because it goes against current science concepts." Acupuncture is an accepted form of treatment by doctors in the Far East in countries like China, but it is met with skepticism in Western society. Confirmation of Vodyanoy's hypothesis could bring together the two medical philosophies, provide an unlimited source of individualized stem cells and bring new diagnostic and therapeutic methods. He says the highest potential impact could be in pain management, developmental biology, tissue regeneration, organ reconstruction and diabetes and cancer prevention and treatment. Even if his hypothesis is overturned, he says it will still bring a better understanding of the acupuncture meridian system's fundamental properties and focus future acupuncture research on the combined actions of the nervous, circulatory, endocrine and immune systems. "I am more excited about this project than any other in my career," said Vodyanoy, who was named a fellow of the National Academy of Inventors in 2013. He received a 2007 Nano 50 Award from NASA and two R&D 100 Awards by R&D Magazine in 2006 and 2007 for inventing his advanced microscopy system that allows scientists to observe nanostructures which cannot be seen with a conventional light microscope. "Based upon the ancient literature, it is not clear whether ancient Chinese doctors knew the specific biological structure of an acupuncture point," Vodyanoy said. "However, it is clear that the ancient knowledge of acupuncture meridians, or body pathways, was more detailed and explicit." In contrast to the Western view of acupuncture meridians as mere lines on the skin, Vodyanoy says the classical Chinese text indicates that the meridians, in fact, possess a three-dimensional shape. They run deep inside the human body carrying liquid, called "Qi," to internal organs. "Much of the misconception of acupuncture results from Qi often being labeled as a 'special energy,' making it seem mysterious, rather than defining it as a liquid containing stem cells with DNA," he said. An example of an acupuncture point would be one located below the knee that is thought to connect to the pancreas. If Vodyanoy's theory holds true, stimulating the point sends stem cells to the pancreas where they regenerate and repair the organ. Vodyanoy is building upon an initial primo-vascular system discovery made by North Korean scientist Bong Han Kim in the early 1960s. Kim published his results in a book printed in Korean, English and Russian, but he disappeared mysteriously in 1966 after communist authorities said his work was unproven. His lab was closed and most of the books disappeared, too, but a few copies still exist, and Vodyanoy has one. "Dr. Kim believed many stem cells are from the chromosomes of dying cells and that the primo-vascular system creates a new assembly of recycled DNA without mitosis, or cell division," Vodyanoy said. "He did not document his methodology, so scientists have not been able to reproduce his results, but we at Auburn have confirmed the existence of the primo-vascular system with microscopy and we will seek to replicate his findings through our research." When a bodily injury occurs, cells divide to make new cells to repair the injury. However, Vodyanoy says the division causes errors in the cells that can lead to chronic diseases including Alzheimer's, cancer, diabetes and many other illnesses. Regeneration and repairing by the primo-vascular system would not have this problem if Kim's work is proven accurate. Vodyanoy's work mirrored Kim's research even before he obtained the book. In 2006, Vodyanoy, while presenting in Auburn, displayed an image of a vessel shown through his microscope—an image that a fellow participant recognized as similar to one in Kim's book. That professor had randomly discovered a copy of Kim's book while traveling in China in 1965, but it was written in Russian, so he could not read it. After the conference, he mailed the book to Vodyanoy, a native of Russia, who began comparing his work to Kim's. Vodyanoy is among a select group of scientists in the world researching the primo-vascular system. He is a founding member of the International Society of Primo Vascular System established by professors Kwang-Sup Soh of Seoul National University in South Korea and Kyung Kang of the University of Louisville. Vodyanoy participated in the organization's first international conference in 2010 in South Korea and is on the organizing committee for next conference planned for 2018, also in South Korea. "In the second century AD, Galen described the blood circulatory system," Vodyanoy concluded. "Fifteen hundred years later Thomas Bartholin discovered the lymphatic system. Medical advances from the acupuncture meridian system could be comparable to the discovery of the lymphatic system. We should not wait hundreds more years for this to happen."